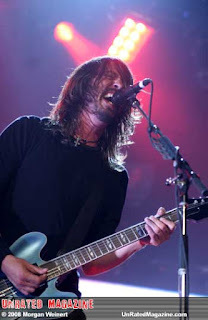 The first Foo Fighters global trek since the 20th Anniversary trek that placed #5 in 2015's top grossing world tours, the Concrete and Gold Tour has seen the Foos reaching new peaks of their estimable powers. "Foo Fighters keep going and going. The first 2018 North American dates of the Concrete and Gold world tour have been confirmed: The new shows has kicked off back in April 18 in Austin, Texas and will run through the band's July 29-30 return to Chicago's Wrigley Field. Included on the newly announced itinerary are a July 16-17 two-night stand at New York's Madison Square Garden, a July 21-22 encore doubleheader at Boston's Fenway Park, and so much more. Back in Chicago the tireless Foo Fighters will have openers, Melkbelly who will open the Sunday, July 29 show, followed by The Struts and then Foo Fighters. The following night Monday, July 30, Touched By Ghoul will open the show, followed by The Breeders preceding Foo Fighters' headlining set. Gates open at 5 p.m. and the music starts promptly at 7 p.m. each night. The Foo Fighters are consistently reaching new peaks of their estimable powers and never disappoint their fans. get ready for a killer performance as always by the Foo Fighters, you don’t want to miss out!